Four second-year MBBS students have been restricted from the college by the anti-ragging committee of the college. An anonymous email has been sent by first years stating that 4 seniors have ragged them before the fresher’s party. The email was sent to MCI (Medical Council of India) and has been forwarded to IGMC officials and have received an audio clip established the allegation of raging as well and Shimla Superintendent of Police (SP) told that FIR is being lodged against the 4 second year students. They also mentioned relevant actions will be taken once the FIR is registered. Congress MP Shashi Tharoor said India is grossly spending on education and health. As most individuals spend for their individuals whereas poor people end up losing everything for getting cured in private hospitals. He also mentions that it is a good decision taken by the Indian chamber of commerce to conduct an interactive session on this topic and also mentioned that the education sector as “over-regulated” and “how the education system followed here is not focused on creative thinking. Here, students are taught what to think and not how to think. These are encouraged in our classrooms “It would really helpful if government focus on all the necessary deeds. 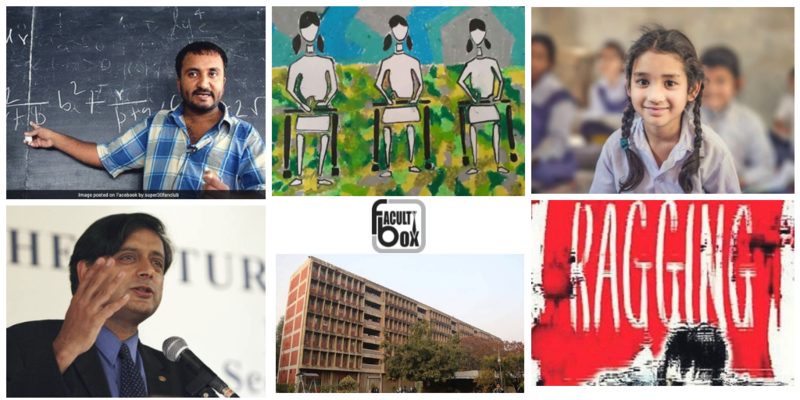 Mathematician and Super 30 founder Anand Kumar will be awarded in Dubai this week for his “pioneering” contributions to the field of education and illuminating the lives of many talented students. Co-chairman of Malabar group said, “We take pride in honoring Mr.Anand Kumar who has made a positive difference in the lives of many with his meaningful innovations. Anand Kumar’s life has involved a lot of struggle and his contributions to the field of education is indeed pioneering,”. He has helped poor students to crack into IIT’s and more than 500 students made into IIT since MR.Anand Kumar has started Super 30. The registrations of the Joint Entrance Screening Test 2019 have started from November 8, 2018, and expected to held on February 17, 2019. JEST is recognized as a national eligibility test by SERB. Different courses have available on the official website as well. Those who are willing to appear for JEST must have completed their final year exams by August. The JEST exam score is valid for one year. Click on the link to know How to apply? The traditional style of teaching and learning in Dubai is becoming outdated as new disruptive ways taken the lead. With respect to that a part-time schooling project called “RAHHAL” is expected to revolutionize the education sector in the emirates. It helps students to think about their Careers instead of spending long hours in schools and few parents and teachers have opinions like how traditional and “Project RAHHAL” can help their children and students. India’s education is in a desperate stage. The blame comes on the teachers and bad infrastructure, less student’s attendance, and teachers being absent and no proper teaching programs. Coming to the infrastructure the right to education was started in 2010 and Schools infrastructure was improved a lot. While there was much tremendous progress which has been done in terms of drinking water and toilets. Most of the children are done admissions in the schools but only some part of the students come to school regularly. The teachers being irregular in class as raised to 2.5 percent. due to this reason, this will be impacted on student growth and currier.